You’ll have chills and they’ll be multiplyin’ when you take a look at our Grease-inspired room. 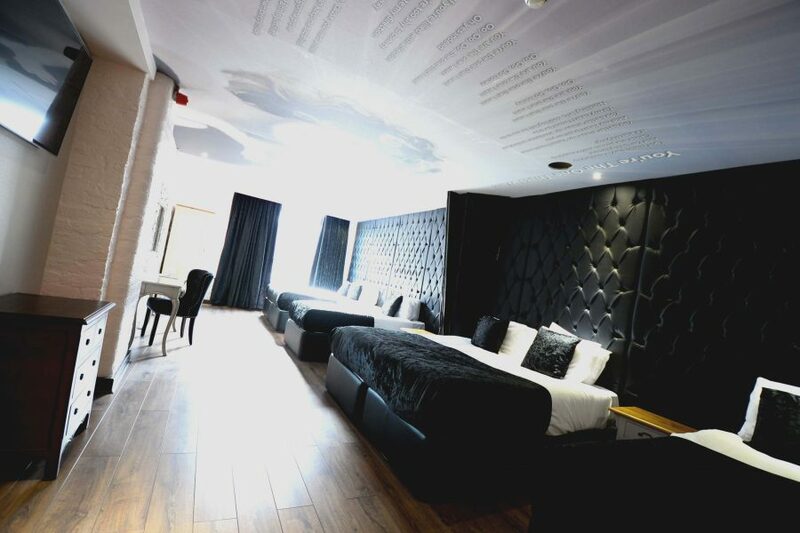 Sleeping up to 6 people, our stunning room is the perfect way to stay in Liverpool city centre, as we’re closely located to the city’s finest restaurants, bars, shops and attractions. 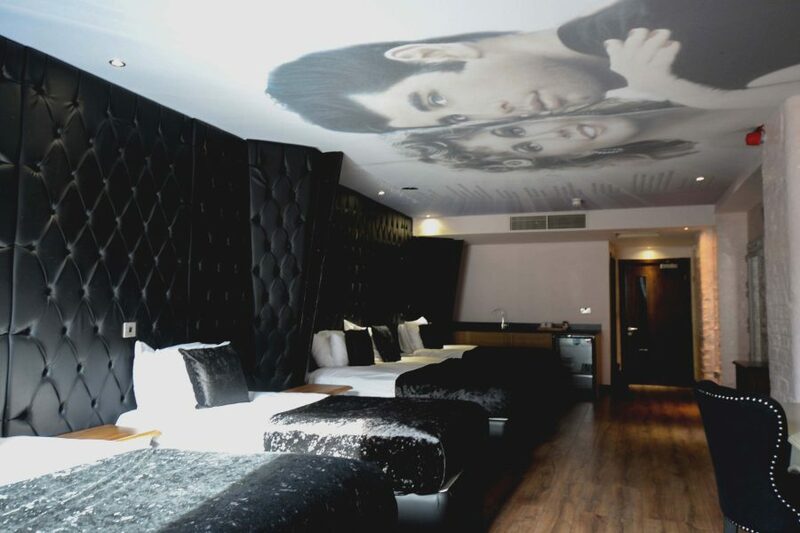 You can guarantee you’re in for an amazing night, as our room has been designed to celebrate the hit 1978 musical, with Sandy and Danny immortalised on the ceiling. You can also relax after a busy day in style, as our Grease room features a large screen TV, kitchenette and a double Jacuzzi bath. There’s nothing left, nothing left for you to do but book a stay with us. Grease has to be one of the most famous movie musicals of all time, offering the soundtrack to many people’s youth. With songs such as ‘Summer Nights’, ‘We Go Together’ and ‘You’re the One that I Want’, it’s not hard to see why the film became an international hit that’s stood the test of time. So, how did it all start? Many people might not be aware that the movie Grease is based on a musical, and not the other way around. Jim Jacobs and Warren Casey wrote Grease the musical, which debuted on Broadway in 1971. The musical was named after the greasers, which was a 1950s working-class youth subculture in America. The inspiration for the plot was from Jim Jacob’s experience at William Taft High School in Chicago, leading to him collaborating with Warren Casey to both write the music and lyrics. The off-Broadway was directed by Tom Moore and choreographed by Patricia Birch, who later choreographed the film adaptation, as well as the sequel Grease 2. The musical later moved from the Eden Theatre to Broadway’s Royale Theatre, before heading to the larger Majestic Theatre. In 1972, Grease received a total of seven Tony Awards and ran for 3,388 performances by the time the production came to a close in 1980. The musical’s success was also replicated across the world. In 1973, Grease hit the West End stage at New London Theatre, with a then-unknown actor named Richard Gere taking on the lead role as Danny. It was also revived for the London stage at the Astoria in 1979. The musical has been revived across UK, USA and international theatres throughout the 90s and 00s due to popular demand, with everyone hoping to feel the buzz and brilliance of this phenomenal production. John Travolta and Olivia Newton-John captured the world’s hearts in the hit movie Grease, which was released on 16th June 1968. The critically-acclaimed film was a box-office smash, becoming the highest grossing movie of the year. In fact, as of 2016, Grease continues to serve as the highest-grossing movie musical of all time. Not only did audiences fall in love with the movie, but the songs were sang across the world, with the soundtrack becoming the top-selling soundtrack in history. The film also bagged a nomination for one Academy Award for Best Original Song. The movie should never have worked. The cast were much older than their characters. While John Travolta (Danny) was 23, Olivia Newton John (Sandy) was 28 years old, and Stockard Channing (Rizo) was 33 and Jeff Conaway (Kenickie) was 26. Olivia Newton-John had only just dipped her toe into the acting world, and so was deemed as a risk. However, film, which took just five weeks to make, was a roaring success, and the actors became overnight stars of the big screen. Set in a 1950s high school, audiences became absorbed in the story of two high school teenagers who fall in love, despite their very different personalities, style and reputations. Featuring crazy dream moments, random singing and plenty of music, audiences have been singing and dancing away to this song for decades.